The Elves of the Second Age were dressed in green and other bright colors. The Elves of the Third Age were dressed in dark colors, reds and browns especially. The Elves of Rivendell and Eriador were mostly dark-haired, whereas the Elves of Lorien and Mirkwood had blond hair. Except for Elrond’s commanding yells in the prologue battle scene, the Elves tended to speak in low, husky voices; Men spoke in more normal voices. Very few of Tolkien’s Elves have blond hair; most are dark-haired (but there are more blond-haired Elves in Tolkien’s Lorien and Mirkwood than in his Rivendell). Tolkien’s Elves speak in “high, clear” voices, not low, husky voices. Peter Jackson’s Elves seem to lack a sense of humor. Nearly all of Tolkien’s Elves display some amusement or at least express a sense of irony. 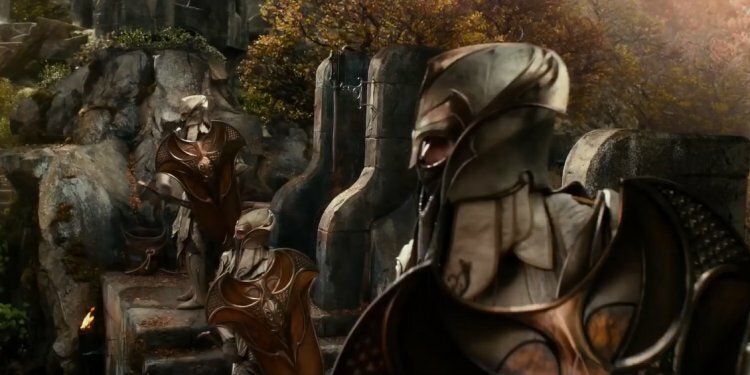 Peter Jackson’s Elves wear some sort of “elf armor”, a sort of stylized plate armor; J.R.R. Tolkien’s Elves wear chain mail. It would be difficult to visually depict all the distinctions Tolkien made between various characters and cultures. Short of tagging every Elf in the film with a subtitle that says “Elf” one must choose a visual style for Elven characters that leads audiences to conclude that the Elves are not simply Men. The pointed ears was a simple decision that has been popularized by role-playing games and fantasy novelists who came along after Tolkien. The movies really had no time to dwell on the Elves’ philosophical ideas. Even Tolkien himself barely squeezed any Elf philosophy into The Lord of the Rings, but there are some scenes that are very revealing in a subtle way. I can only think of Elrond’s conversation with Awren from “The Two Towers” where Peter manages to convey something of the “other issues” that concern Elves. In the books the Elves are always talking about leaving Middle-earth; in the movies the need to depart from Middle-earth is shown in several scenes, but one might easily get the impression that the Wood-elves are not as obsessed with leaving Middle-earth as the other Elves. Even Thranduil’s Elves were vulnerable to the compulsion, as Tolkien’s sub-plot for Legolas reveals. The movies probably did well enough in depicting the Elves as holding themselves above the affairs of Men, Dwarves, and Hobbits but there was really no time to dwell on the immense amount of grief and guilt that the Elves should have felt for the harm they had done to Middle-earth by creating the Rings of Power. In fact, the movies lead the audience to believe that most of the Rings were made for Dwarves and Men, and that is simply not the case in the books — but one has to read The Silmarillion and Unfinished Tales of Numenor and Middle-earth in order to completely understand the history of the Rings of Power. Hence, the movies did well enough in explaining the history of the Rings but had to sacrifice a lot of other history in order to show the audience complete vignettes. And that is really all that the audiences of either the movies or the printed Lord of the Rings see of the Elves anyway: limited but self-contained vignettes. In that respect, Peter Jackson was able to do about as well as J.R.R. Tolkien, and I think it can be said that the movies had to devote less time and attention to the Elves.